Tiwangi Kyle was a treasure hidden in the darkness. As a child she was abandoned by her father, witnessed abuse, and became a woman who was abusive, angry, hostile, and unable to give or receive love. In her desperate longings she fell prey to relationships with men that led to crime and addiction. Tiwangi was a timid little girl trapped inside the cage of a broken woman. She longed to be free. A five-year prison sentence in 2006 was used by God to bring Tiwangi to a place of freedom in Him. He used the faith dorm at the Murray Unit to bring about the transformation needed for her to live a life of liberty and peace. God revealed His amazing love to Tiwangi through the faithfulness of the volunteers who gave their time and hearts to the faith dorm and through this she learned how to live and love. She was able to build relationships with other women of God who shared her faith. She took classes in the faith dorm with women of like faith. 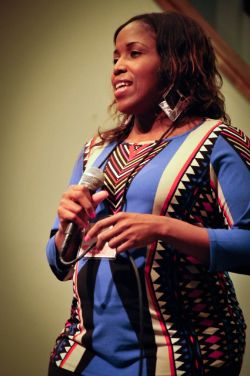 She aligned her mind, will, and behavior with the word of God and as a result, Tiwangi was truly transformed. Upon release, God continued to give Tiwangi favor. She was restored with her children, gained steady employment, and purchased a vehicle – all within seven short months. God also favored her to become the supervisor of a tortilla manufacturer. She conducted business on a level that she could never have accomplished outside of the grace and favor of God. In November 2013 she left her full-time job to pursue the call of God on her life. She founded The Ginger Beasley Foundation, a mentoring program that focuses its efforts on nurturing girls with incarcerated mothers. God inspired her to write two books titled “From Grace to Glory,” and “Until I Become,” which will be published in the near future. Tiwangi has grown to love the Lord with all her heart, and that changes everything.